A Ryokan is a particular type of large, luxurious traditional Japanese inn. Ryokans typically feature tatami-matted rooms, sliding doors, a large central room for socializing, communal baths and a nearby hot spring. Everything about them is traditional, from the wood and rice paper architecture to the yukata they supply for their guests to wear. Most are family owned and feature traditional Japanese room service, sometimes with very exotic food. There is a good chance the inn is run by a really short kind old lady. In works set in Japan, they are frequently featured in a Hot Springs Episode or Beach Episode. Common activities for guests include bathing, table tennis and visiting the local festival. For more information see The Other Wiki article linked here. Love Hina's Hinata house was an inn before it was converted into a girls dorm. Later gets converted back into an inn by Kanako to serve one guest. The characters stay at a Ryokan in Kyoto and one at a beach. In Mahou Sensei Negima! they also stay at a Ryokan in Kyoto and one at a beach. Word of God says they are the same locations. The Patlabor OAV Versus is centred around a Ryokan. Detective Conan has stayed at at least 10 of these and in every one there has been a murder. Hanasaku Iroha takes place in one with hot springs. It is focusing on its workers. Hanaukyō Maid Tai episode 7 "Promise at the Resort". Taro takes the maids to one of these places to enjoy the hot springs. Private Prince: Miyako Sakuragawa is a graduate student at Eito University against the wishes of her family, who wants her to take over their Ryokan. Skip Beat! : Sho's family runs a ryokan and his parents wanting him to inherit it with Kyoko is one of the reasons he runs away. Nana - Nobu in Nana is the heir of his family's Ryokan but he'd rather just play the guitar. Bartender - Miwa's family used to run an old-fashioned hotel chain before they modernized. 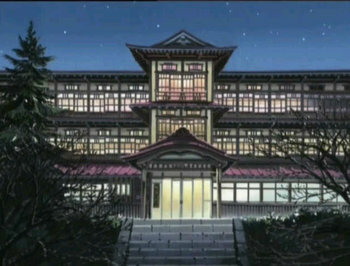 Fruits Basket: The Sohma family owns one, which is run by Ritsu's mother. They visit it in the Hot Springs Episode. Natsume's Book of Friends: Natsume stays at one while on the trip with his study group during which he met the young kitsune. He goes to another one later with Tanuma which Tanuma spent a lot of time at as a sickly child in order to attend a festival Tanuma never got to go to since he was always ill due to his reaction to the presence of youkai. A suicide club in Paranoia Agent ends up here after several failed suicides attempts in the woods nearby. While they lie awake on their futons fantasizing about Shonen Bat killing them all right there, who should show up in the next room? In Yuri!!! on Ice, Yuri Katsuki's family runs the last remaining one in the small Kyushu town of Hasetsu; there used to be more, but most of them closed down as the town's population dwindled. It's complete with hot springs and a short old lady (Yuri's mother, Hiroko) running it. Love Live! Sunshine!! : Chika Takami's family owns and lives in one. In Raidou Kuzunoha vs. King Abaddon, one of these inns becomes your home base during a chapter of the game. It's complete with a hot springs and a short old lady. Persona 3: The school trip to Kyoto has the students staying at one. Persona 4: Yukiko Amagi's family runs a famous one which she will take over soon. Osu! Tatakae! Ouendan 2 features a retired lady wrestler who married into a family that runs such an inn and is trying to impress her mother-in-law. The Nancy Drew game Shadow at the Water's Edge is set in a ryokan that doubles as a Hell Hotel.